1. From either the My Lists or Public Lists pages, click the Edit Settings... link to access the Module Settings window. 2. Scroll to the bottom and select "True" for the Show Category Selector option. Click the Save button and then click the Done button. 3. From the Administration menu, select the Lookups option. 4. Click the List Category link and add your desired Categories. 5. From either the My Lists or Public Lists pages, click the Edit Settings... link to access the Module Settings window. 6. Scroll to the bottom and click the Search button in the Specific Category Limitation option. Select the default category in the Lookup Values box. This is the category that defaults when you add a new list. Click the OK button when you are done. 7. Remember to click the Save button and then click the Done button on the Module Settings window. You can create lists by choosing desired criterion that results in a list of names who meet the selected criterion. Once the list displays, you can merge records with existing documents or reports, bulk update selected records, send an email or SMS text message, create labels, or export to Excel. For each list you create, you can use either the Basic or the Advanced List option. Basic lists use the AND logic whereby records must meet each criterion you select. 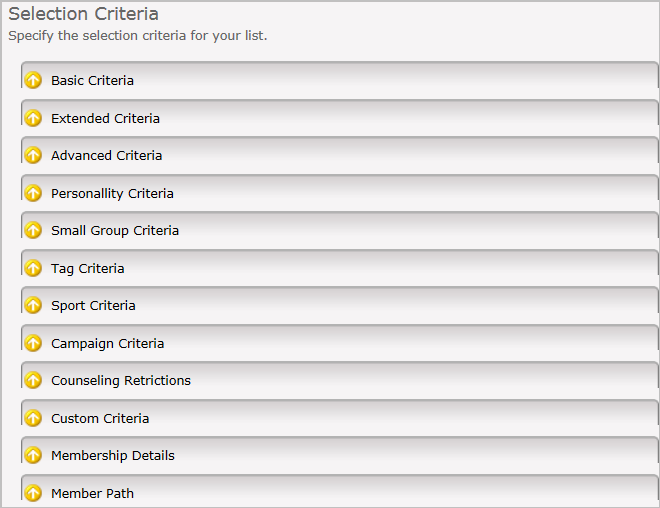 Whereas, the Advanced List option gives you the option to select either the AND or OR logic for each criteria. For either list, the more criterion you select, the narrower the results are for the list. 1. From the Membership menu, click the Public Lists or My Lists option. 2. Click the Add New List icon to create a new list. 3. Enter a Report Name. 4. 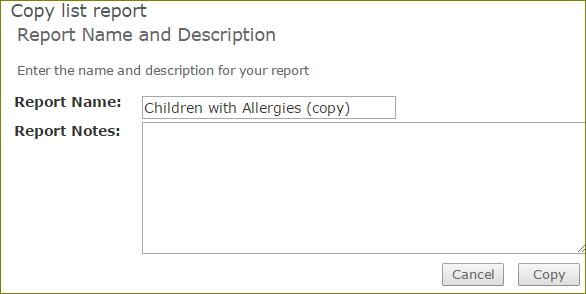 Select a Report Type. Options are Computer Systems, Contribution, Group, Parent and Person List. Use Contribution Lists to run lists specific to Contributions. The steps to create lists are the same as My and Public Lists. The only exception is the List Type is set to Contributions. 5. Select a Category, if available. 6. Enter a Description that adequately describes this List. 8. Click the Criteria Group Expand icon to expand the section and select your criteria. Ask yourself, “Who do I want on this list?” The answer to this question helps you select the criteria. Available sections and criteria may vary for your organization. Criterion differs by Report Type. This section displays personal information. Criteria options may vary for your organization. You can use the % and_ wildcards in some fields. Use the Null Values to include records that do not meet the selected criteria or the field is blank. This section displays individual and family information. You can enter .5 in the Serving Hour box to represent � hour. •Email – You can search for an exact email or a portion of an email, but using the search parameter drop down. •Birthdate – To search on an exact date, put that date in both boxes. To search on a range, enter the earliest date in the first box and the latest date in the second. •Birth Month – To search on an exact month, put that number in both boxes. To search on a month range, enter the earliest month in the first box and the latest month in the second. If you want a month greater than a number then enter that number in the first box, leaving the second blank. •Birth Day – To search on an exact day, put that number in both boxes. To search on a day range, enter the low number in the first box and the high number in the second. If you want a day greater than a number then enter that number in the first box, leaving the second blank. •Anniversary Date – Use this option to search by wedding anniversary date. A complete MMDDYYYY date format is required. If the year is not available, consider using a default year such as 1900. •Adults – Use this option to search for records with family role “Adults”. •Children in Family – Use this option to search for households with a specific number of records marked “Child” for family role. •Serving Status – Use this option to search for individuals who are active in a Serving Tag. •Serving Hour – Use this option to search for individuals who are active in a Serving Tag and serving a specific number of hours. You can enter .5 in the Serving Hour box to represent � hour. This section displays additional demographic criterion. •Date Add – Select an option from the drop-down and enter a date in MMDDYY or MMDDYYYY format or click the Calendar icon to select a date. Drop-down options are equal to, not equal to, greater than, less than, greater than or equal, and less than or equal. Consider using this criterion to search for new records. •Date Modify – Select an option from the drop-down and enter a date in MMDDYY or MMDDYYYY format or click the Calendar icon to select a date. Drop-down options are equal to, not equal to, greater than, less than, greater than or equal, and less than or equal. •Main/Home Phone – Select an option from the drop-down and optionally enter any part of the phone number. Drop-down options are equal to, not equal to, starts with, like, is blank or is not blank. Consider using this criterion to search for records with missing phone numbers prior to adding to a calling campaign. •Distance From Organization – Select an option from the drop-down and enter a distance (in miles), to search for all people who live that distance to or from your organization. Arena searches all addresses that have been geocoded, if your organization subscribes to this service. 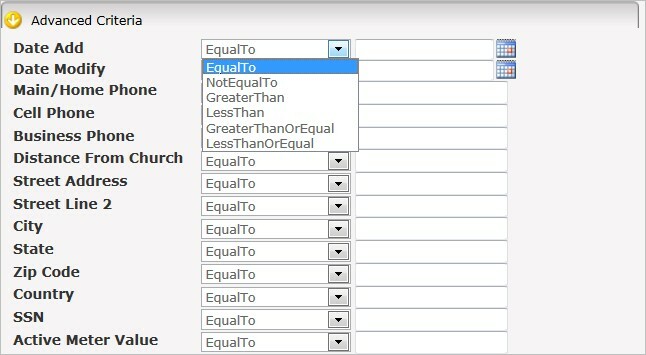 Drop-down options are equal to, not equal to, greater than, less than, greater than or equal, and less than or equal. •Address Fields - Select an option from the drop-down and enter the desired value. Consider using this criterion to search for records with a missing or an incomplete address prior to sending snail mail. Select the street address, city, state and zip where the fields are not blank to verify all records have a complete address. •SSN – Use this criterion to search for records with a specific, partial or blank social security number. •Active Meter – Use this criterion to search for records with a specific or blank activity meter. This section displays personality criterion from the Spiritual Gifts and DISC section on the Person Detail page. •Spiritual Gifts – These check box options may vary with your organization. •DISC Scores – You can search by DISC scores or a combination of scores. To search by an exact number, enter that number in both boxes. To search using a number range, enter the lowest number in the first box and the highest number in the second. If you want a number greater than another number then enter that number in the first box, leaving the second blank. This section displays group specific criterion. Role – This is the role of the member in Groups. Small Group Status – You can search by Group Status. You can also search by In a Small Group or Not In a Small Group. 1. Click the Expand Folder icon to expand and continue selecting or deselecting each group level. 2. Click once to add a Check Mark in a check box to search for people who are in that small group and check all levels under that group. 3. Click twice to change the green check mark to the Deselect icon to search for people who are not in the selected small group. Using the Deselect option in Groups and Tags is a useful tool when you need to identify people who are not in a Group, Serving Tag, Ministry Tag, or Event Tag. 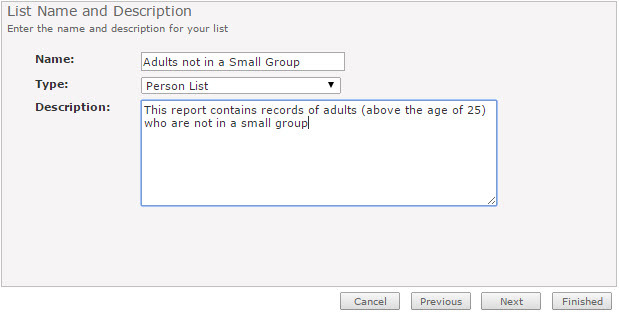 A blank box indicates you are not using the group as criteria. 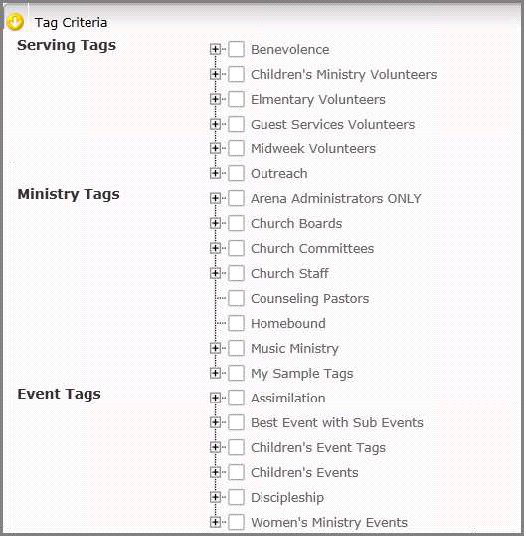 Use the Tag Criteria tab to search by specific Serving, Ministry and Events. 1. Click the Expand Folder icon to expand and continue selecting or deselecting each tag level. 2. Click once to add a checkmark icon in a check box to search for people who are in the tag and check all levels under that tag. 3. 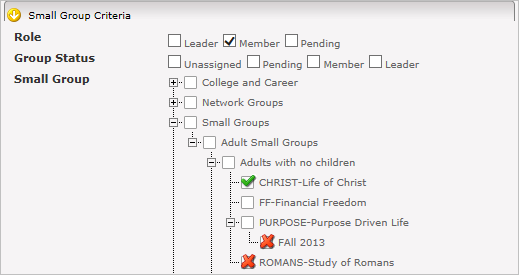 Click twice to change the green check mark to Deselect to search for people who are not in the selected small group. Using the Deselect option in Groups and Tags is a useful tool when you need to identify people who are not in a Group, Serving Tag, Ministry Tag, or Event Tag. This section displays criterion specific to sports. This section displays criterion specific to calling campaigns. By default, this section is blank. If your organization has created custom attributes, see your Arena Administrator. 1. Click the Next button. 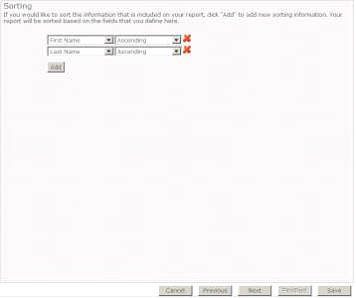 You have the option to save the report at any point in the Wizard process. 2. Select what fields to display on the Field Selection page. The default fields to display are in the Selected Fields column. The available fields you can add to display are in the Available Fields column. If the same field name exists in multiple Attribute Groups, the field name includes the attribute group, such as Member Path-Activity Score, as shown below. 3. Click the Select icon to add available fields to the Selected Fields column. Press the "Ctrl" key to select multiple fields. 4. Click the De-Select icon to remove selected fields. Press the "Ctrl" key to select multiple fields. 5. Click the Select All icon to move all available fields to selected fields. 6. Click the De-Select All icon to move all selected fields to available fields. 7. 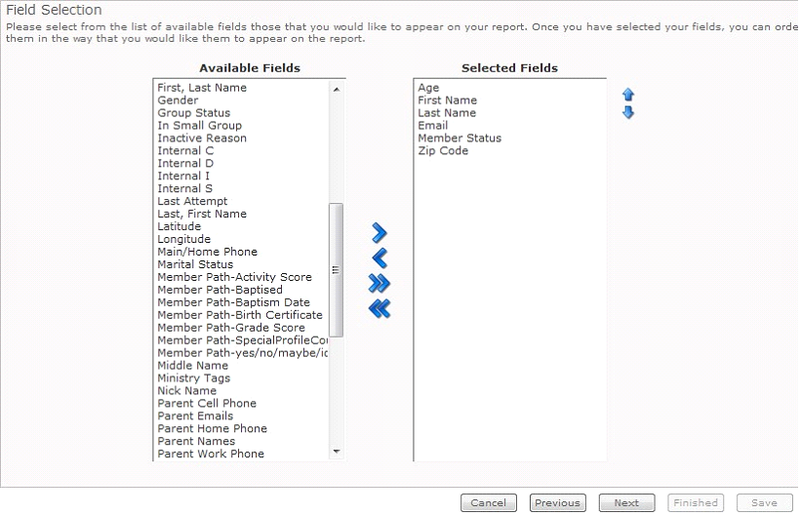 Select the fields you would like to display on the final report. 8. Order the selected fields by using the Change Order icon to the right of the Selected Fields column. 11. Click the Next button. 12. Make sorting selections. Arena allows you to sort by any of the Selected Fields. Default sort options are First Name and Last Name. Click the Add button to add other selected fields by which to sort or change the default sort options. 14. Click the Finished button to display the list results. If you create the list on the Public List page, it is available for all users with permission to this page. If you create the list on the My List page, it is available only to the user who creates the list. This is also the page where you can move the list to/from the Public/My List pages. Click the Display SQL Query link to view the list query. The Advanced List option allows you to select Criteria as before, but with the addition of AND/OR Boolean logic to use for each criterion (control) and the option to group criteria. The below steps outline the process for using Boolean logic for criteria selection. You can use the remaining steps as previously outlined in Public Lists and My Lists of this help file. 2. Click the Add Group button. 3. Click Select criteria from the criteria Group. 4. Add a second Control or Group. 5. Once you add at least two controls, you have the option to select either the AND or OR logic for each criteria. 6. Repeat steps 2 through 4 for every control you would like to include in this report. On the view list page, all selected criteria displays in a columnar format. 1. Click the Bulk Update icon to update all the selected records through Person Bulk Update. 2. Click the Merge Member icon to merge selected records into one record. 3. Click the Send Email icon to send email to the selected names through Arena Communications. 4. Click the Send SMS Message icon to send a SMS Message to the selected names. 5. 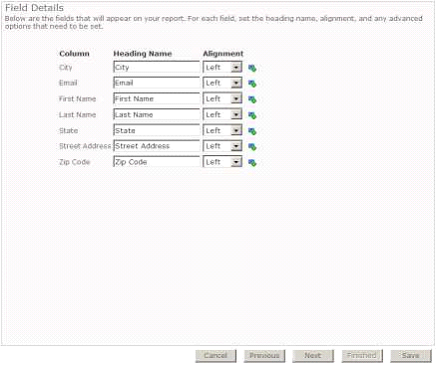 Click the Word Merge icon to mail merge the selected names with an available document. 6. Click the Export to Excel icon to export selected records to an Excel spreadsheet. When exporting to Excel, all fields from the active page export in addition to required fields. Required fields are set in List Configuration. 7. 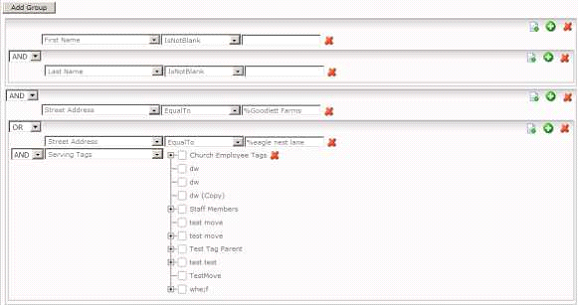 As your staff creates more Lists on either the My List or Public List page, the page displays all Lists, a description of the list, the list Category, the list creator, the date the list was created, the date the list was most recently run, the number of records returned on the most recent run, the Copy List icon, the Edit icon and the Delete icon. Users with access to the Public Lists page, can view, edit or delete a List. You can choose to merge selected records with any available document such as labels. 1. Click the Select box of the records to include in the merge. If the records you want to include are across multiple pages, change the page size. If you want to include all records across all pages, do not select any boxes. 2. Select a document from the Available Merge Documents drop-down. 3. Click the box for Combine Family Members, if desired. 4. Click the View button. 5. Then click the Open or Save button for the final merge. 1. From the list results page, select the report. 2. Click the View button. 3. Select or enter report parameters. 4. Click the View Report button. For some reports, you need to export the report to view all results. 6. Click the Export link. 1. Click the Edit icon on the My List or Public List page, or the Edit List Criteria link on the Report page. The List Wizard page displays and you can make the necessary criteria adjustments on every page. A bold criteria section indicates selected criteria. You can copy a list on either the My List or Public List page. Once you copy the list, it displays on the page of which you copied the list. So, if your goal is to copy the list from the My List page and make the copied list available on the Public List page, use the below steps. You can also copy a Public List and ‘move’ the copied list to the My List page. 1. From the Public List or My List page, click the Copy List icon. 2. Rename the list in Report Name. 4. Click the Copy button. The New Report icon indicates the copied List. 5. Click the Edit icon to modify the copied report. 6. You can now click through all steps and make any desired changes including where to display the list. To make the list available on the My List of the current user logged in, remove the check for the List is available to everyone check box.